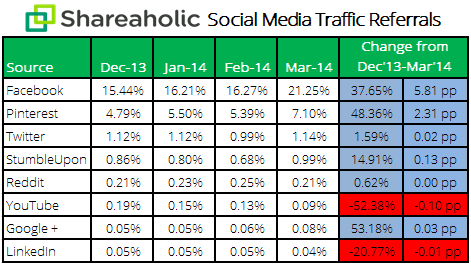 The first quarter of 2014 is now over and the first stats about traffic and overall performance of various social networks are in. Shareaholic prepared the stats for this first glimpse of 2014. On a previous report, published during the last few weeks, we got a first impression on what to expect from social networks and the quality of the visitors they bring along to websites. Back then, Youtube, Google+ and LinkedIn, proved to channel visitors which engaged the most with the websites. Right now, with the new statistics, the outcome is very clear; Pinterest can no longer be ignored, nor can Google+. Apart from demonstrating the highest surge in traffic, both social networks, still outsiders compared to Facebook, seem to gain audience’s preference for an obvious reason; they are not overcrowded. #Pinterest and #Google+ are not overcrowded and this seems to bring traffic to websites. As Facebook keeps its first place and struggles with content saturation, secondary, more eclectic networks could become top traffic providers. Users will always want control of what they see and will always want to keep social networks personalised and Pinterest (mostly) checks the boxes. 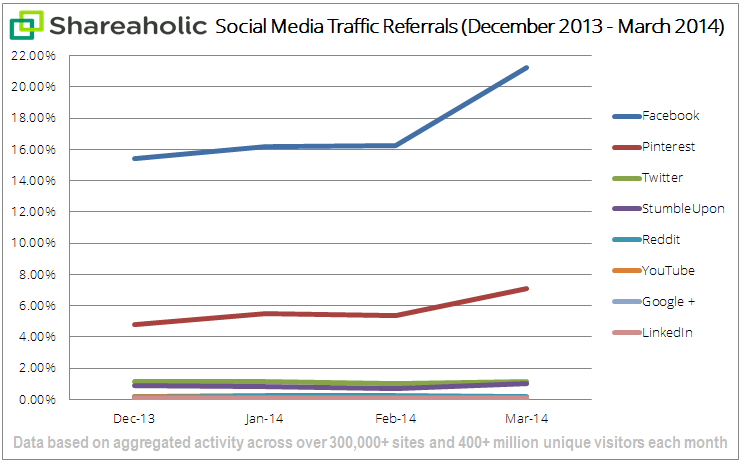 Although the share of traffic generated is 7% and 0.08%, respectively, the growth rate keeps a steady positive pace. The results don’t end here. Twitter‘s performance showed fluctuations and ended in a borderline positive result. Alarming rates appeared for LinkedIn and Youtube. Next quarter will be -eventually- show some more representative numbers for the professional network, which debuted its publishing platform in late February. #LinkedIn underperformed during Q1 2014. Will its publishing platform help turn this around?